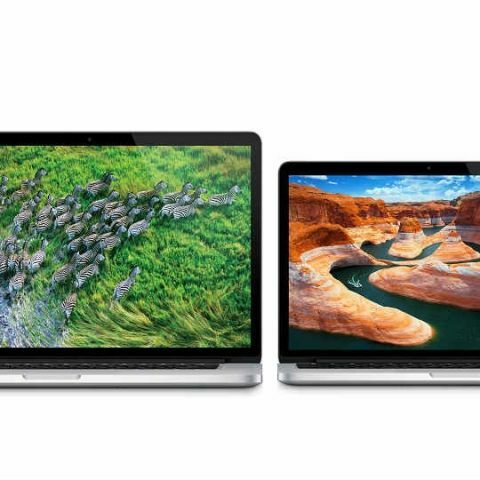 Apple updates its Retina Macbook Pro lineup with refreshed Haswell Chips, more RAM. 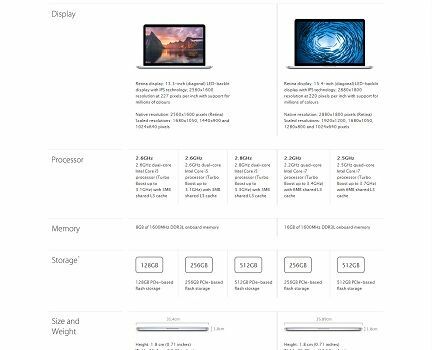 Apple has discreetly updated its Macbook Pro Lineup with some minor spec changes in both the 13 inch as well as the 15 inch models. Both the new 13 inch models with 2.4GHz Intel i5 chip have been updated to a 2.6 GHz intel i5 chip with 8 GB of RAM instead of 4 GB. The processor on the new 15 inch Macbook Pro has also been updated from the old 2.0 GHz Intel i7 chip to a 2.2 GHz Intel i7 chip. RAM on the new Macbook Pro 15 inch has also been changed from a 1600 MHz 8 GB one to 16GB one. Last October Apple made some changes to the 13 inch Macbook Pro, that update added the Haswell chips and Iris graphics to both the models. Apple also added 802.11ac WiFi, Thunderbolt 2 ports and a faster PCI storage in that update. The new models come just a few months ahead of the next version of the Mac OS X update "Yosemite" which was announced this year at WWDC 2014. The Yosemite BETA was released to a million developers earlier this week. The latest lineup has seen some price cuts in US market but prices and availability of the New Macbook Pros are still under doubts in India. We will let you know as soon as we get further information.